We're two short weeks shy of Baby Chew's due date, and we're excited, but also a little nervous of what it would be like as we transition to becoming new parents. We know it won't be easy, but we're beyond grateful for this amazing blessing. Growing the little one in my bump has been such a miraculous experience that I know I'll miss having the silly kicks and rolls - I sometimes feel like our baby has 8 limbs! So of course C & I poured our hearts into making a cozy little corner for the little one before he comes. It warms my heart so much to see C get excited about it and also do whatever it takes to prep, while he's still struggling with his health this entire time. It was his idea to have a gender reveal party for one. Just like I mentioned it our previous post, even with chronic illness, there are the not-so-bad days and we make most of every little moment. Every activity he gets to be involved in is an achievement unlocked, and could've involved so much more effort and energy than a normal person, but we are grateful for each of those. 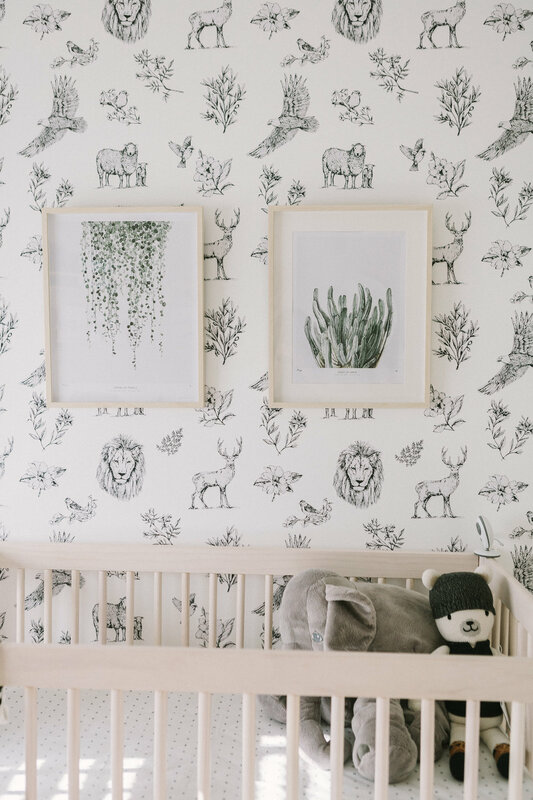 I'm still working on a couple of blog posts that would talk about the many little things I've learned so far through this pregnancy that I would love to share, but for now, here's a tour of Baby Chew's nursery. When you enter into the room, you would be greeted by a little tapestry I had woven for the nursery, that includes some of the alpaca yarn we bought from our trip to Peru. (Peru is such a memorable place for us, and it's actually the first place Baby Chew has been aside from Canada, although it was just a tiny little seed then). I recently stumbled upon this beautiful and relaxing hobby. I love how flexibly artistic you can get, simply by choosing a different stitch, yarn texture or color. I learned how to weave through the book from this Etsy Shop, who has an incredibly awesome owner that was so willing to help me and teach me. I was also able to pick up most of my supplies from her shop, because all her yarn was just so gorgeous. We also installed a dimmable light switch for those late night feedings that we know we're gonna get. I'm still going to change this little entryway in the future as I'm waiting on some wall hooks and some laser-cut pieces that should be arriving in a week, but for now, this is what it'll be! On one of those better days, C painted one of our walls white, and then we worked together to apply the "wallpaper" I designed - these are actually just decals, so we can remove and replace them one day, and I got them made at Urban Walls. We selected some animals and botanicals that were meaningful to us from the Bible. I know I paint as well, but this time around I thought I would support a fellow entrepreneur, so I ordered some prints from My Deer from Netherlands, and add a little greenery to our space. For the changing table, we're simply using the top of the dresser (this used to be my work cabinet, and it's also from Ikea), and we love this minimal Keekaroo changing pad because you can simply wipe it clean, instead of having to wash the covers. I'm sure we'll learn more lessons about this once the baby comes, but for now here it is! I also really wanted to add a little bit of decor, so we added a simple round mirror from Ikea, an accordion wall hook from Amazon, these absolutely adorable animal heads from Ella and the Roo (hand-dyed and handmade from this lovely lady from the UK), these adorable wooden toys from Indie Owl. A couple of my friends have also recommended learning about the RIE and Montessori style of parenting, so I've tried to incorporate some of that as we decorated the nursery. 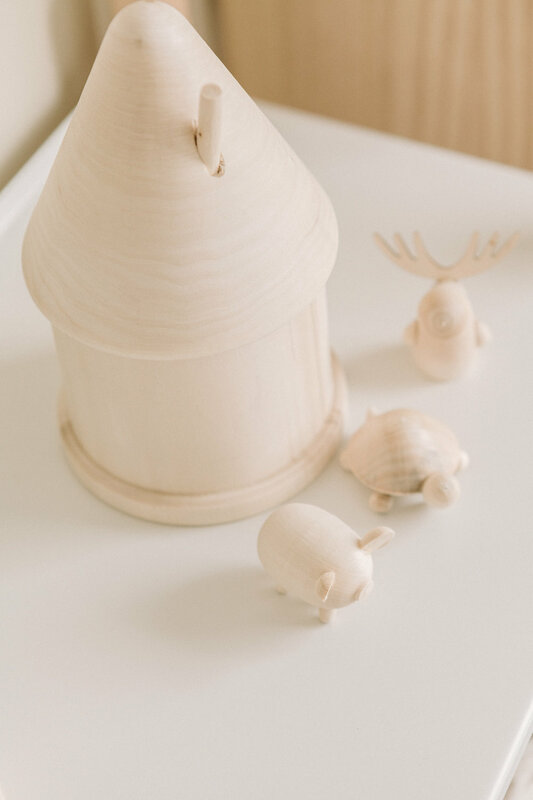 We have a clean and open toy shelf, with simple, natural objects that only truly become toys in the hands of a child. The toys and books are a collection of gifts that we've received, some from Etsy, Chapters Indigo, Minimono, and Wee Gallery. We also added a little drawer section for other items that we would just stuff in, but ideally we wouldn't (or shouldn't) have more than these for toy storage! 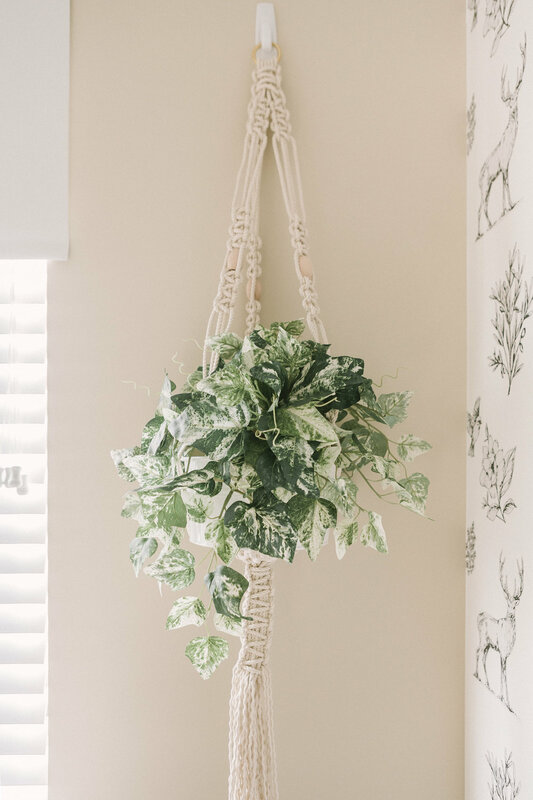 I also recently discovered the joy of macrame, which I picked up from a DIY kit of a plant hanger, which I got from Modern Macrame. I loved it and I filled it with a fake plant so I didn't have to introduce bugs and worry about watering a plant in my child's room. The pot and the plants are both from Ikea, and it cost me less than $10! It's behind my rocking chair, so don't worry it shouldn't pose a hazard! This little nook is probably going to be where we'll spend lots of days (and nights) so we wanted it to be comfy and cozy, a little happy place for our family. We also added a fluffy rug from Lorena Canals, which I actually ordered from Well.ca >> this is one of our fave places to order organic and wholesome products at great prices. And the best part is that this rug is machine washable, as I know baby stuff is just never going to stay clean, so having it washable is a huge plus. The fact that it's organic and all that good stuff is just another plus. C really likes the rug, I frequently find him hanging out in the baby's room on the floor, cause it's soft and comfy... and I just treasure these little memories in my heart. The little stuffy that I'm holding is from Cuddle and Kind, and I love these shops with a social aspect, as every doll they sell they also donate 10 meals for hungry kids! We have yet to figure out the exact situation for sleeping, as the babe will probably not sleep in his crib for a little bit of time, so we have a Moses basket that we can move from room to room and a baby lounger from Snuggle Me Organic. Also, isn't the Baby Chew onesie the cutest? I recently discovered this cute shop called Cheerily and make sure you sign up for the newsletter because they have discounts every now and then. You can customize little shirts from babies to moms (I wish they had some for dads!). Instagram has been the best source for all these little knick-knacks that we've gotten for the little one, and I just love supporting small shops. I also got some blackout roller blinds from Ikea as this room is east-facing, so it gets a ton of light in the morning. I also got myself some of these comfy caftans from Dwell and Slumber, they call these modern housedresses because they're so functional, yet they still look amazing! I love the fact that they have buttons AND pockets! I think I'll be living in these for the next couple of weeks - especially since Baby C is gonna be a summer baby, and I'll have parents and in-laws around... I can't just be living in my underwear! These lovely photos of myself are taken by my very good friend Nadia from Nadia Hung Photography - she's also a mom and I've learned so much from her these past few, and I am so grateful for her love and support. She primarily shoots weddings, but occasionally does these shoots for her clients as well. We can't wait to meet our little one, so hopefully we'll have an update for you guys soon!